Will high clockspeeds triumph over low bandwidth for this RAM? GSkill's triple kit looks outgunned on paper, and so it proves in practice. Poor value compared to the competition. Initial impressions do not bode well for the GSkill Tri-Channel 1600MHz. Judged purely on the official specifications, this admittedly snazzy-looking 6GB triple-channel kit shouldn't stand a snowball's. After all, at £135 it's more expensive than both Kingston's HyperX 1,600MHz effort and Crucial's Ballistix1,600MHz offering. Compared to the Crucial kit, the difference is getting on for £20. That's a problem because not only is the GSkill Tri-Channel rated at the same 1,600MHz frequency as the competition. It also clocks in with tardier 9-9-9-24 timings. Both Kingston and Crucial give you quicker 8-8-8 timings for less cash. As for cooling kit, the Tri-Channel's anodised red heat spreaders look slick enough, but are hardly the last word in high-fidelity heat dissipation. In other words, this kit costs more than the competition, but does seem to offer anything extra by way of speed or spec. It's hard to spot where exactly the extra money is going. A quick scan of the performance numbers the GSkill Tri-Channel spits out running at the default 1,333MHz frequency doesn't provide much insight into the slight price premium this kit demands. True, there are no horrors across our full suite of tests. 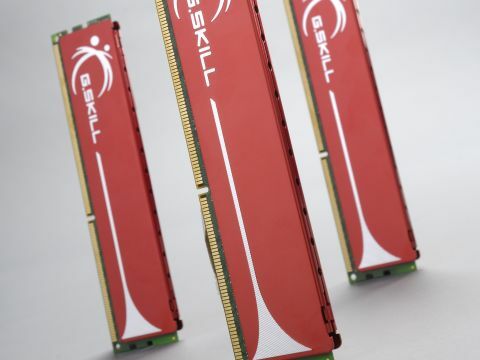 But whether it's synthetic measures such as bandwidth and latency, or real-world applications including gaming and HD video encoding, these Gskill DIMMs are at best on a par with and usually a click or two behind the cheaper Kingston HyperX sticks. Up the ante to 1,600MHz and things don't look much better. In fact, the raw memory bandwidth goes south in dramatic style. In truth, this is something of a testing anomaly rather than a true reflection of the GSkill Tri-Channel's data throughput. Consequently, this kit continues to match its closest competition in our World in Conflict game bench. But the bandwidth result is probably indicative of the wheels beginning to come off in terms of timings. With that in mind, it's actually a little surprising to find the Tri-Channel kit keeps on trucking at 1,866MHz. But, again, the raw bandwidth reported is well below expectations. That's a shame because performance in our other metrics is actually pretty solid at this frequency. All of which makes GSkill's work hard to gauge. On the one hand, the extra speed is attractive in terms of both performance and overclocking headroom. On the other, the measure bandwidth issues suggest possible stability and compatibility issues. The choice is yours.